Control chart is a statistical tool used to monitor whether a process is in control or not. It is a time series graph with the process mean at center and the control limits on both sides of it. (Upper Control Limit & Lower Control Limit). The values lying outside the control limits show that the process is out of control. There are several other criteria with which the out-of-control nature of the process is detected. The variation of the process can be attributed to two causes: Common Cause and Special cause. Common cause variation is the variation that is inherent of the process and no eternal factor can be associated to it. It is indeed very difficult to reduce this type of variation. Special cause variation is any variation that is caused by factors that are not a part of the process or system. These are normally outliers, and can be easily detected. The use of a control chart helps one to distinguish between a common cause and a special cause. Identifying the type of variation helps in setting up the right improvement path. Therefore the use of control chart becomes very vital in Process control. There are different types of Control charts based on the data that we use. One needs to understand these types clearly to use the right chart for the data. Before understanding the types, one should know about the concept of ‘Rational subgrouping’. Rational subgrouping is the process of selecting samples (One or a group) at various points of time to study the variation. An important point is that all the samples in a subgroup should be selected at the same time. There should be enough time-gap between the selection of subsequent subgroups. While plotting a control chart, the Mean and Standard Deviation of each subgroup are also calculated along with the mean of the overall observations. This is done to study whether there is variation with-In subgroups or between subgroups. This is an important concept because the type of control chart varies with respect to the sample size of the subgroup. The below graph easily explains the decision tree for selecting the appropriate graph. 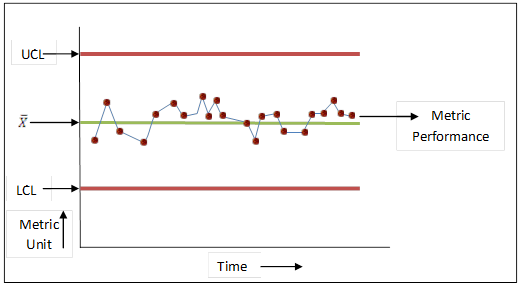 Continuous Data: When the data is continuous, the Control chart uses two parameters to study the variation: Mean and Range or Mean and Standard Deviation. Based on the sample size of a subgroup, the type of chart varies. Individual Moving Range Chart: It is a special case of control chart, when the subgroup has only a single sample selected. When there is only a single value, the subgroup mean cannot be calculated and only the individual values are plotted with the Mean as central line. The Range between adjacent values is calculated. Since the range varies every other data point it is called as Moving range. The moving range is also plotted in another control chart with the average of moving range as central line. X Bar-R chart: When the sample size is less than 10, range of the subgroup is appropriate to estimate the with-in group variation. This also has two charts plotted, one for the mean and other for the Range. X Bar-S chart: When the sample size is more than 10, range of the subgroup is inappropriate to estimate the with-in group variation and hence standard deviation is used for estimating the variation. Attribute Data: When the data is discrete, there are two ways to measure and plot the charts. One is to take the count of defective units (items rather than units. There are two charts available based on the sample size: ‘np chart’ and ‘p chart’. ‘np chart’ is used for subgroups of uniform sample size; whereas ‘p chart’ is used for varying sample size in sub groups (Then the calculation is based on proportions). Another way is used when the process measures the count of defectives (events rather than items). There are two types of charts available based on sample size: c chart and u chart. 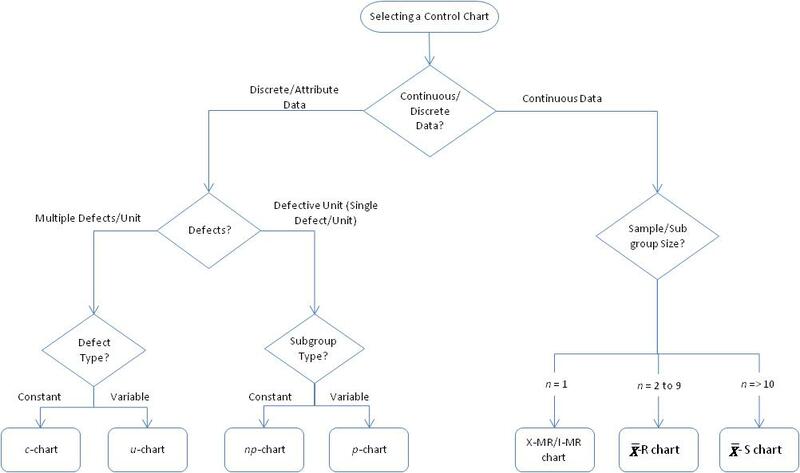 C chart is used for constant sample size, and u chart is used for varying sample size. The same is illustrated in the decision tree given above. Users can choose the appropriate chart for process control.